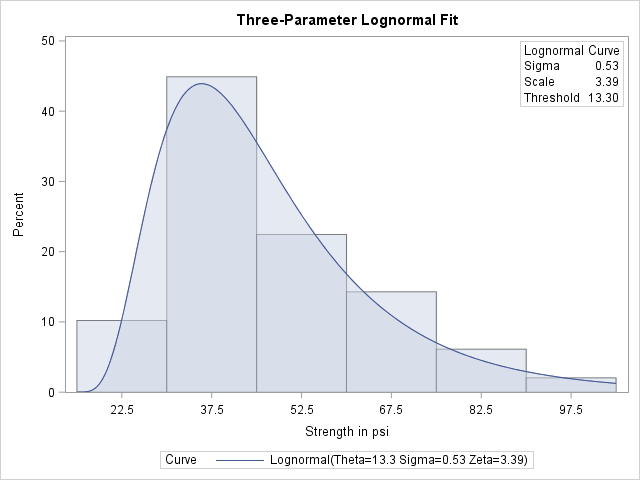 If you request a lognormal fit with the LOGNORMAL primary option, a two-parameter lognormal distribution is assumed. This means that the shape parameter and the scale parameter are unknown (unless specified) and that the threshold is known (it is either specified with the THETA= option or assumed to be zero). If it is necessary to estimate in addition to and , the distribution is referred to as a three-parameter lognormal distribution. This example shows how you can request a three-parameter lognormal distribution. The NOPRINT option suppresses the tables of statistical output produced by default. Specifying THETA=EST requests a local maximum likelihood estimate (LMLE) for , as described by Cohen (1951). This estimate is then used to compute maximum likelihood estimates for and . Note: You can also specify THETA=EST with the WEIBULL primary option to fit a three-parameter Weibull distribution. A sample program for this example, uniex14.sas, is available in the SAS Sample Library for Base SAS software.